In 2010, many countries in Latin America celebrated 200 years of independence from Spain. It was a momentous occasion. The break with the Spanish crown after nearly two centuries under colonial rule meant that, for the first time, Latin America was free to decide where it wanted to go, what kind of society it wanted to construct in the future. It is against this historical backdrop that we celebrated this year’s National Independence Day. Like other Chileans, we made the most of the 4 day holiday. On the 18th September, Chile commemorated the declaration of its independence which laid the foundations of the modern state. It was impressive to see flags flying high from every house and block of flats, from every church and in every corner of the city as friends and family gathered together to celebrate. Traditional foods were prepared: roasted meat and empanadas. Showing off their traditional folk costumes, people danced the cueca, proud to have been born in this country. Our team of volunteers celebrated with Bibiana’s family in the home of her grandparents. About fifty people, parents and friends, come together here each year to celebrate life. Bibiana is a young academic who is hosting one of our volunteers. Her family was delighted to receive representatives from so many different countries. For us it was wonderful to be able to experience Chilean hospitality and to be caught up in the mood of celebration, delighting in their traditions. At the heart of this year’s bicentennial celebrations was the story of the 33 miners trapped in the partially demolished mineshaft in Copiapó. Discovered 17 days after the accident, they have now spent a total of 6 weeks in the chamber 700m underground. I remember the day we heard the news that they were still alive, that the team of rescue workers had been able to determine the exact location of the shelter and communicate with them in the depths of the earth. Spontaneous celebrations broke out as news of the breakthrough spread, with horns honking and Chilean flags appearing out of windows, flapping in the wind. The past three weeks had seen a growing mood of desperation and sorrow for the loss of these men’s lives. And then what a miracle! Finding these survivors so deeply buried under the surface was the best thing that could happen for a country still marked by the tragic earthquake just a year ago. So many expressed their gratitude that « God has been so good to these men. » The Christian roots of the Chilean people are evident. They reveal themselves as much in everyday life as in times of extraordinary sadness or elation. Some of us headed south to Concepción, a city on the Pacific coast, invited by the family of one of the volunteers in our team. They were very generous. We were able to visit some of the zones that had been devastated by the earthquake and tsunami just 7 months ago. It is astounding to see how entire apartment blocks toppled like packs of cards. One of the three bridges over the Bio Bio river has disappeared. Another, severely damaged, is currently being repaired. The only bridge still in action bears signs of the terrible effects of the shock. In Talcahuano, the « zero zone » struck by the enormous wave which destroyed the coast after the quake, the damage is obvious. Between those houses still standing are gaping empty spaces once occupied by the houses that were less resistant. Similarly, the traces of looting are still visible. Marooned far inland there are still many small boats, and even larger fishing boats, that were swept up and dragged out of the bay by the force of the water. The costanera – an avenue running alongside the port – is still being repaired. Worse still is the sight of so many thousands of families still living in little one-room shelters, of approx 4 or 5 metres, called medias aguas. Hastily erected from wood and planks, they provide refuge for a people that has, unfortunately, suffered far too often from natural catastrophes such as this one. Many of these huts were built by young people from central and northern Chile. The solidarity and collaborative spirit of the Chilean population is remarkable. These youngsters were ready to drop their work in order to go and help those who had lost everything. Our preparation team continues to visit parishes and lead regular prayers. We invite young people to participate in our pilgrimage. Yes, we, the volunteers, are strangers in this country, yet we go to meet those we do not know in order to listen to them and share our concerns. 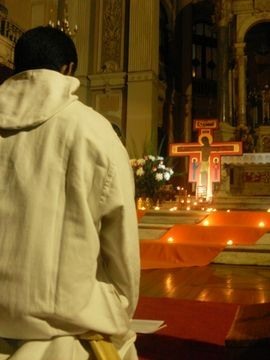 It helps so much to see that, despite our cultural differences, the essence of Christian life remains the same: a focus on the Word, silence and prayer. Living in simple fellowship and rejoicing because God accompanies us. Celebrating life every week, turning ourselves towards the mystery of the risen Christ every day. In Santiago, distances are sometimes great and the length of time it takes to travel from one place to another can be very tiring. The volunteers visiting the north of the city discover that, though the welcome is simple, prepared with meagre resources, here it is a gift to be able to welcome a stranger. In the eastern and western zones our volunteers are extremely busy visiting parishes and schools. After each meeting a quiet sense of joy – prompted by perhaps just a word or a simple gesture – motivates us to continue our work for the brothers of Taizé and the sisters of Saint André. 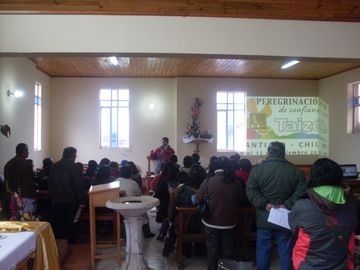 Beyond the eastern zone, in the Maipo vicariate, preparations are also being made to welcome the chiquillos (young people). Generally, we are met with enthusiasm and people are eager to accept our invitation. Every afternoon there are prayers as well as meetings for the preparation teams. The southern zone is the one which differs the most from the vicariates of the mountains (cordillera). There are marked social differences. From the very beginning of the preparation, people have been keen to help and set to work. It is here that there is the highest concentration of religious schools. The big challenge is to get the young people, in their colleges and church movements, to take part in the pilgrimage.